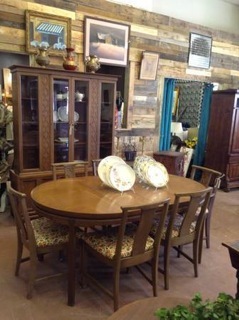 I just purchased a mid-century Broyhill Premier Inspiration china cabinet, dining table and six chairs. I was trying to find out the exact year and maybe some pictures of other items in that line. So far, no luck! Maybe you could help me find some more info and value? I love them very much. 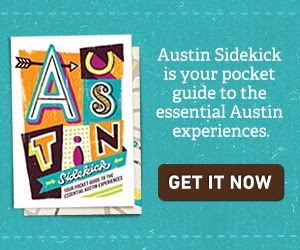 I just wanted to know the history of the brand. I've written about the history of Broyhill furniture company and the history of Broyhill Sculptra, which was probably being built around the same time as the Broyhill Inspiration line. 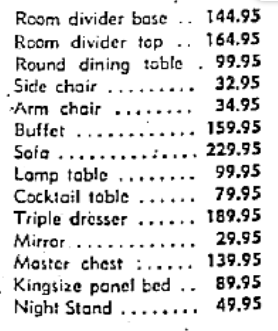 The earliest newspaper ad I can find for Inspiration by Broyhill Premier is from 1959 and says it's the "first showing of Broyhill Premier's dramatic new collection, Inspiration." It's hard to say if it's the store's first showing of Broyhill Inspiration or if they were announcing the world premier of the line. Either way, it's probably safe to say that Broyhill Inspiration was build in the late '50s and continued to be made into the early to mid '60s. 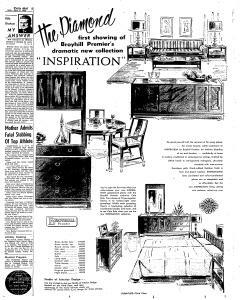 The other scrapes of newspaper ads I can find say that the Inspiration line included over 40 pieces for the bedroom, living room and dining room and that it's made out of mahogany with brasstique pulls. 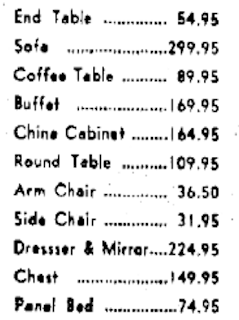 I was able to find two original price lists for Inspiration furniture in some old furniture store ads. Of the over 40 pieces there's at least a room divider, round dining table, side chair, arm chair, buffet, sofa, lamp table, cocktail table, triple dresser, mirror, master chest, kingsize panel bed, night stand, end table, coffee table, china cabinet and a chest. 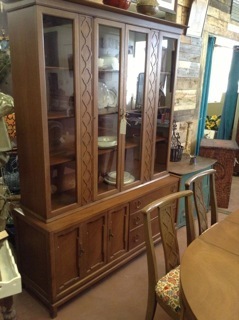 I was also able to track down an vintage Inspiration by Broyhill Premier brochure. Inspiration's arabesque panel motif is fram a Moorish palace, From Ming China, the door-pull in tone-on-tone brasstique. Its architectural elegance and quiet air of assurance is Georgian English. And distinctly American, the intuitive blending of art and function. for a home serene in its beauty, subtle drama. Master-crafted in swirl-grained mahogany given a tawny Malabar finish. 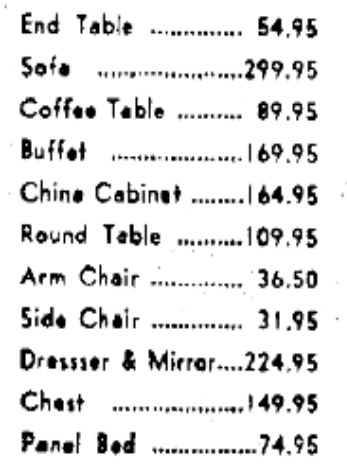 Over forty correlated pieces from which to choose... each modestly priced. I haven't seen an actual pictures of the line, other than the ones Marissa sent me. As for value, it's always hard to give a price online, but here are some tips for pricing mid-century furniture. Hope that answers a few of Marissa's questions and now we all have another line of mid-century Broyhill furniture to look for while we're out hunting vintage furniture. Thank you again for this post and your research. I really hope I can acquire some more pieces from this line. I really love the panels with the moroccan style design. I am considering myself lucky to have the pieces I do since I have not found any others. Thanks again! Absolutely. It's always fun to track down what I can about Broyhill furniture that I didn't know existed. It's a great line. Good luck with your hunt for more.